Head left from the trial gate (if you want to skip out on some goodies, you can just go right through the cave entrance), you can to the woman to the right if you want to heal first. 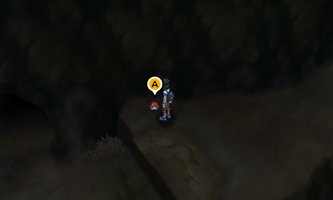 Begin hopping down the cliffs, picking up a Zygarde Cell on the third cliff and pickup a Charcoal on the next cliff down. Enter the cave entrance to get to the other side of the volcano. Head south and defeat the trainer and pick up TM39 - Rock Tomb to the right. Start heading south and defeat another trainer to the right if you want, otherwise continue left down the route. Hop down the cliffs, picking up the Burn Heal along the way. Head back right onto Route 7. 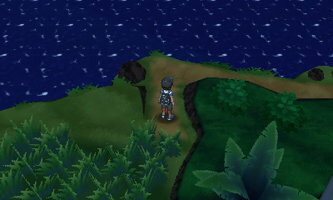 Head north onto Route 8 towards the next trial. If it's nighttime, you can pick up a Zygarde Cell next to the trailer. 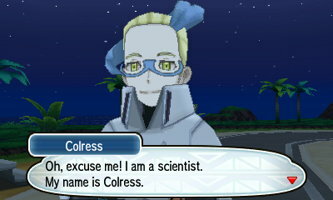 Head left and you'll be stopped by a cutscene with Colress. He'll give you TM43 - Flame Charge. If you follow the small path left of the trailer it will lead you to a Big Pearl. Continue left, defeating two trainers and grabbing a Hyper Potion. Just south of the Hyper Potion is a Miracle Seed. You can grab some berries under the tree to the north There's a trainer below this with a Miltank that might give some trouble as it will constanly be healing itself. North of here through some tall grass you'll find an Ultra Ball. Continue left on the route past another trainer and then head right to the Dream Park. Behind the trailer you'll find a Thunder Stone. 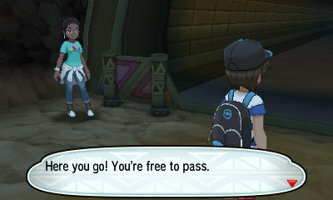 Exit and head left until you make it to a Pokemon Center: heal up here. Head left of the Pokemon Center to the motel. You can speak to Gladion in motel room if you'd like; he'll kindly tell you to get out. Behind the motel you'll find a Dive Ball. There's also two trainers you can battle in the parking lot here if you want. 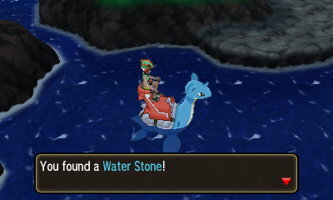 If you surf to the left of the route you can find a Water Stone under water. Head right to the north half of Route 5. You can go south here for a few goodies. Hop down one cliff and continue left to find a trainer and a Zygarde Cell. There will be another trainer and a Hyper Potion to your left. 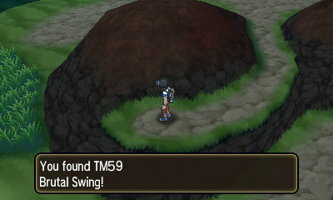 Continue past one more trainer onto the highest cliff for TM59 - Brutal Swing and an Ether. Hop off the cliff and cotinue north through the gate. 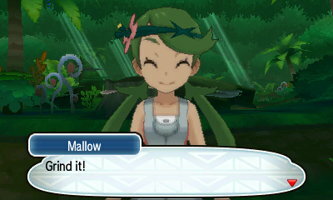 Captain Mallow will greet you and give you the Forage Bag. 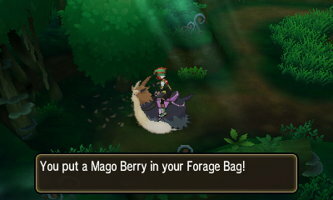 In order to clear the trial you'll need to find a Mago Berry, a Tiny Mushroom, a Revivial Herb, and a Miracle Seed. Immediately head left and investigate the mushroom patch. 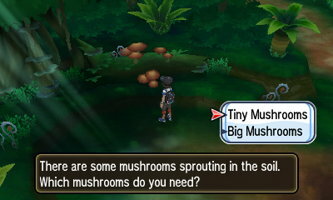 Grab the Tiny Mushroom from here. You'll have to defeat a Shiinotic when you do. Continue north on the left path. Head left in this area until you get to a rustling tree. You'll be attacked by a Fomantis. After you've defeated it, search with Stoutland and it will sniff out the Mago Berry. Head back to the right and north . Go right through the tall grass and grab the Super Potion. Head north into the next area. 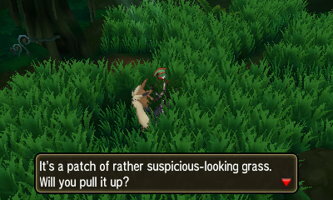 On the left side of the area, use Stoutland to sniff out a Revivial Herb. You'll have to face off against another Fomantis. Go left and crawl through the opening here and you can pick up TM86 - Grass Knot. Exit the area and continue south and to the right. 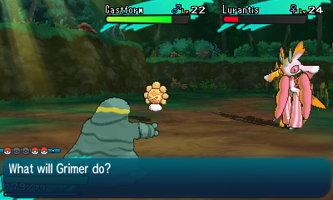 Here you'll need to use Tauros to smash the rocks and pick up the Miracle Seed that is under the bottom-left rock. Make your way back to the entrance by going left, picking up a Big Root along the way. Once you return and agree to cook the ingredients, you'll face off against Totem Lurantis. It will summon ally Castform to fight alongside it. It can heal itself, so watch out for that. If you've got a strong Fire, Flying, or Rock type you shouldn't have any trouble. 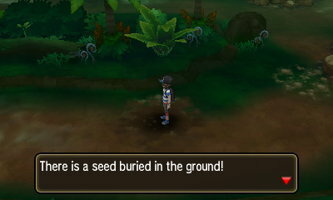 Once it's been defeated, you'll get Grassium Z and 10 Nest Balls. Professor Kukui will also give you TM67 - Smart Strike. This trial is now complete.